watching the yes on I & F ballots float away. Fish one: You’re kinda cute. Where do you live? Second fish: I live just off Hunters Point in the “No on the New 49ers’ Stadium” condos. Where do you live? Fish one: I’ve been living in the “Ammiano for Mayor” projects between Alcatraz and Angel Island, but they’re going to be adding thousands of units next year and I’m thinking of moving. Second fish: My best friend lives in the “Yes on L” towers near Alameda, but they’re always fighting with the “No on G” crabs in the shipping lanes so I can’t recommend that. Have you heard of the new place? Fish one: You mean the “Yes on I & F” estates PG&E built under Golden Gate Bridge? They spent a bundle on those suckers & I heard the roofs on a bunch of them just floated away. Second fish: Yeah, I heard that too. I guess you could go down to the Housing Authority and buy a Section 8 voucher for the really large luxury hotel we’ve been expecting. Fish one: What’s that one? Second fish: You know. … the S.S. Willie Brown. Hey, what do fish know? Been house-sitting in Glen Park. That ends tomorrow. Time to seek another warm, dry spot. Not so easy in this town. Each morning here, I walked from my perch on Tony Hall’s side of the valley over for espresso on Mark Leno’s territory. The people seem to get along. As yet, there is no border guard between the two districts. Back to the Tenderloin. Few nights here. Few nights there. The Osama syndrome. Glen Park is nice. It looks like Sausalito with a variety of houses climbing the hillsides for yet a better view. And soooo peaceful. It is amazing how different the vibes can be in different neighborhoods of San Francisco. You can forget that if you stay too close to your own hearth. I’ve gone months here without seeing the ocean. The Examiner’s Larry Lee interviewed Mayor Willie Brown regarding Willie’s trip to China. Their talk was front-page news on November 26. The mayor & Chinese president Jiang Zemin shared anecdotes of their respective battles to control their enemies. They spoke of the San Francisco Board of Supervisors and also of the Falun Gong. Although the U.S. Congress and the State of California have condemned the Communist dictator’s murder & torture of members of the religious sect, Willie thinks differently: The human-rights issue has not been and will not be an issue that will create a barrier or create a roadblock for improved relationships between San Francisco and China. It’s all about money with Willie. He’s never let the displacement of the poor or musicians or artists or people of color get in the way of his making big bucks off the developers in San Francisco. 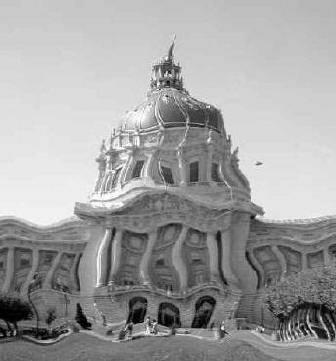 The S.S. Willie Brown steams on toward the overwhelming iceberg of decency, compassion & his next appearance on the ballot. He’ll have to fill the bay with enough ballots to build a new runway for SFO to overcome us next time.